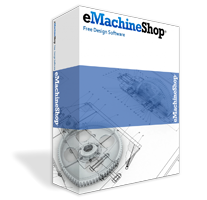 The free eMachineShop CAD software includes a bolt panel wizard. Just Download, fill in the dimensions and select a material. A bolt plate is a plate with a matrix of threaded holes. Bolt plates are used in optics, jigs, etc. Custom bolt plates can be made in almost any material. Select the Bolt Plate wizard. Enter Length, Width, Thickness, Distance between hole centers and Thread Size. Add any additional holes or features.